What’s the biggest tax loophole ? … and, why isn’t it part of the tax reform conversation? I’ve been scratching my head over what the Senate & Congress are going after under the “tax reform” umbrella … and, what are being treated as sacred cows. 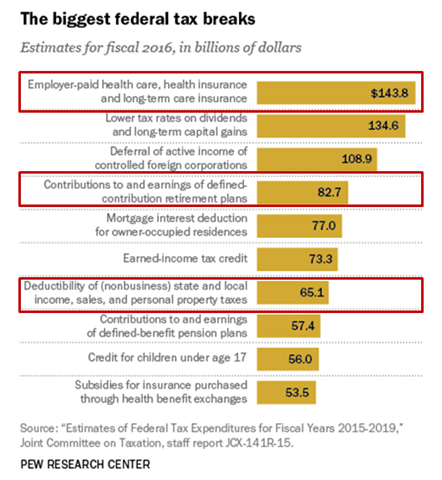 For example, the deductions for mortgage interest and state & local taxes are on the chopping block … but the biggest “Federal tax break” according to Simpson-Bowles and the Pew Foundation is the tax-free status of employer-paid health insurance. Real tax reform would put employer-paid health insurance under a microscope: it’s clearly compensation that should be recorded on W-2s and taxed at ordinary income tax rates, right? And, the loophole creates a severely unlevel playing field. Think of the small business owner (or his employees). That’s not fair, is it? One of the deductions that the GOP is planning to ax is the medical tax deduction. Currently, taxpayers who have high medical expenses that are not fully covered by insurance get some income tax relief. Specifically, the IRS allows you to deduct qualified medical expenses that exceed 10% of adjusted gross income for the year. The threshhold is so high that we’re talking about catastrophic illnesses (think: cancer) and unforeseen emergencies (think: car crashes) … we’re not talking deductibles and co-pays. I haven’t heard a single voice raise up to defend this deduction. The Feds are willing to pour trillions of dollars on ObamaCare subsidies … but, when somebody who pays taxes and pays for health insurance gets hit with a medical catastrophe … they’re (soon to be) on the own. I guess these folks don’t have the same political clout as, say, labor unions with gold-plated employer-paid health insurance. So, in their case, healthcare isn’t different and untouchable. Is anybody really thinking this stuff through? This entry was posted on December 1, 2017 at 6:47 am and is filed under Health Care / Medical Insurance, Tax Loopholes, Tax reform, Taxes. You can follow any responses to this entry through the RSS 2.0 feed. You can leave a response, or trackback from your own site.